Three East Belfast seedcorn businesses received a total of £12.5k in the first round of funding from Inspire Business Angels Investment as part of Global Entrepreneurship Week. Eleanor McEvoy, the new Entrepreneurship Ambassador for Northern Ireland, announced the investments at the end of a Dragons’ Den type event at the Island Arts Centre in Lisburn. The serial entrepreneur said she and her fellow Dragons, business development expert John McGrann and David Drysdale, Chair of Inspire Business Centre, were impressed by the high standard of pitches. “It is not easy for inexperienced start-ups to face interrogation by three highly skilled business Dragons, so huge credit must go to all our finalists for their gutsiness in being prepared to put themselves and their businesses out there,” said Ms McEvoy. Mercury Fitness NI, a unique weight loss and fitness boot camp with an international flavour run by Jason Gillard, received £5k of investment to fund marketing, training equipment and sports kit. Emma Dougherty, owner of Emma’s Cleaning Services, received £5k to enable her rapidly growing commercial and domestic cleaning service to purchase a liveried van and digital marketing support. Sweet Sounds Café, a social enterprise which provides training for young people with special needs, received £2.5k to go towards a second minibus to help transport isolated and vulnerable customers to their premises at Inspire Business Centre. A total of six budding businesses drawn from applicants across the LCCC area were invited to deliver a 10-minute pitch in front of a live audience in the Studio Theatre following a social networking session in the Island Centre Art Gallery. 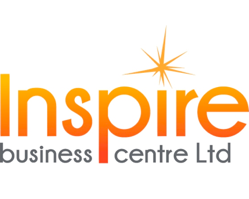 Mark Brotherston, CEO of Inspire Business Centre, explained: “Inspire is much more than a Local Enterprise Agency – we are making a significant contribution to the NI economy and changing people’s lives thanks to the development of an ‘Eco-system’ for entrepreneurship and enterprise. “Inspire Academy is a social enterprise which gives people the opportunity to develop bespoke skills underpinned by accredited qualifications ranging from GCSEs to Degrees. We also deliver innovative programmes, community development initiatives and business mentoring. Alderman Allan Ewart, Vice Chair of LCCC’s Development Committee, said the Council was delighted to sponsor such a unique event.